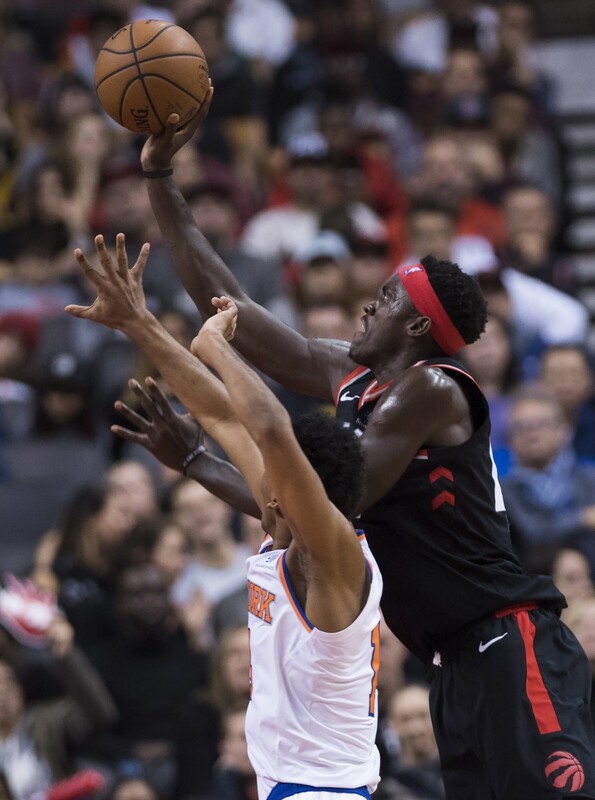 TORONTO (AP) — Pascal Siakam scored a career-high 23 points, Jonas Valanciunas had 19 points and 10 rebounds and the Toronto Raptors beat the New York Knicks 128-112 on Saturday, improving their league-leading record to 12-1. OG Anunoby scored 16 points and Kawhi Leonard, Serge Ibaka and Delon Wright each had 12 as the Raptors won their sixth straight home meeting with the Knicks and improved to 7-0 at home this season. Toronto has won six straight overall. Toronto's Nick Nurse became the first coach to win 12 of his first 13 games since Lawrence Frank started 13-0 with the New Jersey Nets in 2004. Tim Hardaway Jr. scored 27 points and Enes Kanter had 15 points and 15 rebounds for the Knicks, who have lost 16 of their past 19 against the Raptors. LOS ANGELES (AP) — Lou Williams hit a jumper with .3 seconds remaining in overtime, lifting the Clippers to the victory. Montrezl Harrell intercepted Giannis Antetokounmpo's inbounds pass as time expired, sending the Bucks to just their third loss in 12 games. Harrell led Los Angeles with 26 points off the bench. Patrick Beverley added 21 points and Tobias Harris had 20 points and 11 rebounds. Antetokounmpo had 27 points and 18 rebounds for Milwaukee. Former Clipper Eric Bledsoe's 3-pointer tied it at 119 with six seconds remaining. Danilo Gallinari's 3-point try for Los Angeles bounced off the rim at the buzzer, sending both teams to their first overtime of the season.